LINCOLN, Neb. (AP) — Nebraska Gov. Dave Heineman has ordered flags across the state to be flown at half-staff in the wake of a Connecticut elementary school shooting that claimed 26 victims, including 20 children. A statement released by the governor’s office on Friday said that the order was in accordance with a proclamation from President Barack Obama. Flags are to be flown at half-staff until sunset on Tuesday. The killings in Newtown, Conn., appeared to be the second deadliest school massacre in the country’s history, with only the 2007 killings at Virginia Tech claiming more victims — 32 plus the gunman. A law enforcement official said the gunman shot himself to death. UPDATE 4:14PM: NEWTOWN, Conn. (AP) — A law enforcement official briefed on the investigation of the Connecticut school massacre says the brother of the gunman has been “extremely cooperative” and is not under arrest. The official tells The Associated Press that Ryan Lanza, of Hoboken, N.J., is still be being questioned but is not in custody and is not believed to have any connection to the school killings. The official spoke on condition of anonymity because he was not authorized to speak publicly on the investigation. The official says Ryan Lanza’s computers and phone records were being searched but only “in an abundance of caution.” He says Ryan told authorities he had not been in touch with his brother in recent years. 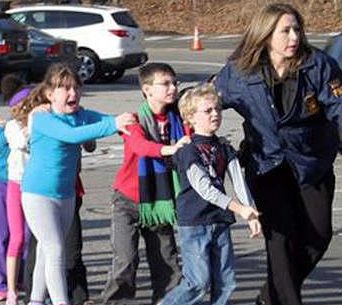 UPDATE 3:45PM: NEWTOWN, Conn. (AP) — The gunman in today’s shooting at a Connecticut elementary school has been identified by a law enforcement official as Adam Lanza, the son of a teacher at the school. Authorities say the gunman killed 26 people, including 20 children before committing suicide. The gunman’s mother is also presumed dead. Authorities say today’s shooting at Sandy Hook Elementary School in Newtown, Conn., took place in two rooms, but they are not giving details on exactly how it unfolded. Youngsters and their parents have described teachers locking doors and ordering children to huddle in the corner or hide in closets when shots echoed through the building. UPDATE 1:41 PM: 18 children were pronounced dead at the scene of the shooting. 2 died later at area hospitals. 7 adults have died. A relative of the shooter died from a gunshot wound at another location. UPDATE 1:31 PM: Obama orders flags lowered to half-staff in mark of respect for victims of Connecticut shootings. UPDATE: According to NBC News, the shooter has been identified as 24-year-old Ryan Lanza. Lanza’s mother was reportedly a teacher at the elementary school and was one of those killed in the shooting. UPDATE 10:56 AM: An official with knowledge of a shooting at a Connecticut elementary school says 27 people are dead, including 18 children. The official spoke on condition of anonymity because the investigation is still under way. ORIGINAL: The Associated Press citing officials, says a gunman has been killed after a shooting at Sandy Hook Elementary School in Newtown. The AP reports the anonymous official said the gunman was armed with two weapons. The Danbury News-Times also reports sources say the Sandy Hook School principal was killed in the Newtown shooting. Police have made no official statement yet on deaths or injuries. Police were expected to hold a news conference some time after 12:30 pm. to give official details about what happened. RAPID CITY, S.D. (AP) — Officials with the South Dakota Game, Fish & Parks Department say at least 3,400 deer have died this year from a midge-borne virus. This is more than twice the reported deaths in 2011 from epizootic hemorrhagic disease. EHD is a common cause for typically small, localized losses in western and central South Dakota. But this year it hit particularly hard in southeast South Dakota, sharply reducing some deer herds in southeast counties along the Missouri River. The losses were high enough to cause several thousand deer tags to be returned or withdrawn prior to hunting seasons in areas where EHD hit especially hard and deer numbers were noticeably reduced. Andy Lindbloom with GF and P says about 4,300 tags were returned at hunter requests. LINCOLN, Neb. – A record 103 active bald eagle nests were recorded in Nebraska in 2012, surpassing the previous record of 90 set in 2011. The first successful modern bald eagle nest in Nebraska was in 1991 in Douglas County. “Even though we say the recovery of the bald eagle in the United States and Nebraska has been remarkable, it truly has been amazing,” said Joel Jorgensen, nongame bird program manager for the Nebraska Game and Parks Commission. Bald eagles nested historically in Nebraska but were extirpated around 1900. The number of early nests is few and it is possible that bald eagles are more common now than before settlement by European Americans. Most bald eagle nests are concentrated along Nebraska’s major rivers. The recovery of the bald eagle is considered a modern conservation success story. The bald eagle was listed as a federally and state endangered species in 1978. Populations declined greatly throughout the 20th century primarily due to the use of DDT and similar chemical pesticides. In 1963, there were fewer than 500 breeding pairs in the lower 48 states. After the banning of DDT and many years of intense management efforts, the bald eagle was removed from the federal and state lists of threatened and endangered species. Bald eagle nest monitoring is conducted and coordinated by Game and Parks but also relies on cooperating agencies and trained volunteers to collect data. Partners include National Park Service, U.S. Fish and Wildlife Service, U.S. Army Corps of Engineers, Platte River Recovery Implementation Program, Nebraska Public Power District and students from Concordia University. “We thank all of the individuals who conducted surveys or provided information during the 2012 breeding season,” Jorgensen said. Multiple national news sources are reporting that former Nebraska Republican Senator Chuck Hagel is the leading candidate for Secretary of Defense. NBC News says Hagel “is likely to be President Obama’s” pick, Bloomberg News says the President spoke with Hagel about the nomination last Tuesday, and CNN says he’s met with both Mr Obama and vice president Joe Biden. White House Press Secretary Jay Carney declined to comment Thursday on whether Obama is considering the 66-year old Hagel…a professor at Georgetown University and chairman of the Atlantic Council international affairs think tank…saying only that the two-term former GOP lawmaker is widely respected. Democratic Sen. John Kerry of Massachusetts – like Hagel, a Vietnam veteran – had also been seen as a top candidate for defense, but with Susan Rice withdrawing from consideration as Secretary of State, Kerry’s now seen as the leading choice there. Hagel angered many Republicans with his frequent criticisms of President Bush’s handling of the Iraq War, his perceived tacit support for Obama against John McCain in 2008, and his jabs at the foreign policy credentials of VP nominee Sarah Palin…anger that rekindled with his endorsement of Nebraska Democratic Senate candidate Bob Kerrey. As Hagel campaigned Kerrey’s unsuccessful Senate bid, several Nebraska Republicans, including Hagel’s successor…fellow Republican Mike Johanns…accused him of endorsing Kerrey because he was angling for a job in a second Obama administration. Hagel blasted Johanns at the time in a news conference saying “Mr. Johanns is all-knowing and understands everything,” “If that was my motive, what the hell am I doing in Nebraska?” Hagel…who has been co-chairman of Obama’s Intelligence Advisory Board…told reporters he had been some offered “pretty senior jobs” by Obama but had turned them down. Nebraska Republican Party Chairman Mark Fahleson says Hagel “burned the last timber in the bridge that remained between” him and the party when he endorsed Kerrey. The South Dakota School of Mines and Technology in Rapid City has begun its search for a new president, but an announcement isn’t expected until next spring. South Dakota Board of Regents director Jack Warner says that’s because the regents are allowing plenty of time for a process that uses broad base input from the campus and surrounding community. Warner says the goal is to hire a leader with some prominence and experience. Duane Hrncir (HURN’-sur) has been serving as acting president since President Robert Wharton died in September. The new president’s expected start date is July 1. OMAHA, Neb. (AP) — One newborn baby in Nebraska has come into the world with a little once-a-century good luck. The Nebraska Medical Center says Robin Heaton of Fremont gave birth to her daughter, Zoey, by C-section on Wednesday. That happens to be the date of 12-12-12 on the calendar. Even more luck comes with the fact that Zoey’s birth was clocked in at 12:12 p.m.
Officials later posted a photo of the newborn on their Facebook page, which has already received hundreds of well wishes. LINCOLN, Neb. – Enjoy an old-fashioned holiday at the home of William “Buffalo Bill” Cody with Christmas at the Cody’s. The event is Dec. 20-23 from 5:30-8 p.m. at Buffalo Bill Ranch State Historical Park in North Platte. Tour Cody’s house, barn and cabin, each lit up for the season. Visitors to the house will find holiday music, hot cider, cookies, roasted chestnuts, 18 decorated Christmas trees and Santa Claus. A park entry permit is required. Admission to the house is $5 for adults. Ages 12 and under and military personnel with identification are free. LINCOLN, Neb. – A new mobile device application for fishing, hunting and wildlife viewing is available through the Nebraska Game and Parks Commission. The app features places to fish and hunt, regulations, maps, species guides, state records and the latest news and calendar events. It also allows the user to purchase permits. The free app, as well as Game and Parks’ state parks app, may be downloaded for Apple or Android by visiting http://outdoornebraska.ne.gov/multimedia.asp#mobileApps. BOX ELDER,S.D. (AP) — The South Dakota Ellsworth Development Authority has taken a step toward removing about 250 homes, businesses and other properties from hazard zones around Ellsworth Air Force Base. The Rapid City Journal reports Lori and Daniel Ellefson have agreed to sell to the authority an easement for their property near the base’s runway, meaning they eventually will move their child-care business and find a new home. Properties that are considered susceptible to airplane crashes and high noise levels could count against the base if it is put on another closure list, as it was in 2005. The base survived. The authority has been working toward removing the 250 properties since 2009. Former Box Elder Mayor Al Dial says the deal with the Ellefsons marks a big moment for that mission.